Somewhat new to off-road racing, Jared Roberts has spent his lifetime on bikes and behind the wheel of fast cars and 4×4’s. The same attributes that have made him successful in business; relentlessly pursuing the latest technology and a knack for thinking outside the box, have assisted him take to off-road racing at an accelerated pace. His vast knowledge of building, developing and structuring companies also plays a vital role in maintaining a strong race team. The leadership skills he has honed running two successful businesses, one in the communications field and the other in the oil and gas industry, are a huge asset to Roberts Racing. Dale Dondel’s company, Racer Engineering, builds the race vehicles used by Roberts Racing. Racer Engineering trucks and open wheeled racecars are known for their innovative features and cutting edge design. Dale’s racing experience dates back to age 7 when he began racing motorcycles. 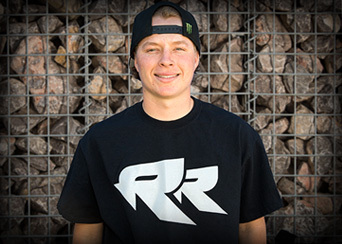 At only 13, he was competing in AMA supercross. Dale’s love of competition has taken him from the arena to the CORR and LOORRS short courses and the toughest desert races found in Best in the Desert and the SCORE International series. He has received the Toyota True Grit award for completing every race mile for an entire season, earned a class 5 championship and countless wins in the most prestigious events in desert and short course racing. Known for his raw speed, Dale set a high bar in 2014 by qualifying in the #1 spot for all but one Best in the Desert series races. One of the fastest guys on dirt, Dale strikes fear in the competition every time he gets behind the wheel. Mike Dondel is the other half of Dondel Brothers racing. His accomplishments mirror his brother Dale’s. On the track or in the desert, Mike has seen it all in his 30 years of off-road racing. Class 5, class 10, class 12, class 1, Trophy Trucks and Pro Buggies are all part of Mike’s impressive resume. He has won at every venue in the SCORE International series including San Felipe, the Baja 500, the Baja 1000, Laughlin; even the Parker 400. He has a class 5 Unlimited championship, a Toyota Milestone award and a SCORE True Grit award. The True Grit award is for non-factory-backed competitors in classes 1/2-1600, 5, 10 and 12 who finish every mile in the six-race SCORE series and have the largest cumulative points total in their class. Competent on either side of the cockpit, under the hood and in design and development, Mike is a co-founder of Racer Engineering. Dakota Meyer is the third living recipient of the Medal of Honor since the Vietnam War, and the first living United States Marine in 41 years to be so honored. Born and raised in Columbia,Kentucky, Dakota enlisted in the United States Marine Corps in 2006 after graduating from Green County High School. He completed his basic training at Parris Island Recruit Training Depot later that year. A school-trained sniper and highly skilled Marine infantryman, Dakota deployed twice to combat duty. In 2007, he deployed to Iraq for Operation Iraqi Freedom; and in 2009-10, he deployed to Afghanistan for Operation Enduring Freedom. In September 2011, President Obama awarded Dakota the Medal of Honor — the highest military decoration awarded by the United States government — in recognition of his acts of extraordinary valor on Sept. 8, 2009. Over the course of a six-hour firefight, without regard for his own personal safety, Dakota repeatedly braved enemy fire in eastern Afghanistan to find and save fellow members of his embedded training team. Wounded by shrapnel, Dakota entered the kill zone four times to evacuate approx. 13 Marines and soldiers and approx. 23 Afghan soldiers. On his fifth trip in, Dakota recovered the bodies of three missing Marines and a Navy corpsman killed in the battle: 1st Lt. Michael Johnson, Staff Sgt. Aaron Kenefick, Hospital Corpsman Third Class James R. Layton and Gunnery Sgt. Edwin Wayne Johnson Jr. Following the battle. Dakota completed his active duty in 2010 and now serves in the Individual Ready Reserve of the U.S. Marine Corps Reserve. Since returning to civilian life, Dakota has started Dakota Meyer Enterprises Inc.in hope of establishing a company that not only leaves a mark in the construction industry but also provides a workplace for his fellow veterans. Johnny’s son, Colton, or as he is affectionately known as “CJ”, has grown up in off-road racing in the shadows of his dad, knowing that someday he would follow in his footsteps. Like his dad, he began his racing career in motocross with regional victories and several trips to the National AMA Championship at Loretta Lynn’s in Tennessee. CJ Greaves demonstrated his Pro Buggy prowess when he won the TORC Series Pro Buggy championship in 2010; his rookie season. Only 14 years old when he won his first title, it made him the youngest driver to win a short course Championship. He followed it up with a second straight Pro Buggy Championship in 2011. Greaves will be defending his 2014 Pro-2 Championship full time in the TORC series but will compete in the LOORRS series for Roberts Racing when his schedule permits. top-performing teams. He has successfully positioned all departments not as functions, but as enablers to accelerate revenues by securing investment capital, the creation of new business and the improvement of operational performance. producers in the U.S. He has continuously led the way pioneering new technology and developing advanced drilling techniques. The practices and efficiencies he has created are used widely by industry leaders like Chevron U.S.A., BP and Conoco Phillips. Garr’s “make it happen” attitude is a huge asset in the challenging sport of off-road racing.